Doctor Victor Von Doom is a fictional supervillain appearing in American comic books published by Marvel Comics. Created by writer-editor Stan Lee and artist/co-plotter Jack Kirby, the character made his debut in The Fantastic Four #5 (July 1962). The monarch of the fictional nation Latveria, Doom is usually depicted as the archenemy of Reed Richards and the Fantastic Four, though he has come into conflict with other superheroes as well, including Spider-Man, Iron Man, Thor, Doctor Strange, Black Panther, the X-Men, and the Avengers. Doctor Doom was ranked #4 by Wizard on its list of the 101 Greatest Villains of All Time and #3 on IGN's list of the Top 100 Comic Book Villains of All Time. In a later article, IGN would declare Doom as Marvel's greatest villain. The character has been substantially adapted from the comics into several forms of media, including television series, video games, and merchandise such as action figures and trading cards. Most notably, Doctor Doom has been portrayed in licensed Fantastic Four live-action feature films by Joseph Culp in Roger Corman's unreleased 1994 movie; Julian McMahon in the 2005 movie and its 2007 sequel; and Toby Kebbell in the 2015 reboot. Cover art for Marvel Double Shot Vol. 1 #2 (February, 2003), by Joe Jusko. Writer Mark Waid sought to redefine Doctor Doom in the 2003 "Unthinkable" storyline (Vol 3 #66-70 & Vol 1 #500), by having him forsake technology and invest entirely in magic. The story took its title from the "unthinkable" act Doom had to perform to acquire this new magical might from a trio of demons: killing his first love, Valeria. With Valeria's flesh turned into new mystic leather armor, the story follows Doom as he imprisons Franklin Richards in Hell, captures Valeria Richards, and succeeds in de-powering and imprisoning the Fantastic Four. He subsequently attempts to prove his superiority to Reed Richards by giving him the chance to find his way out of a prison that could only be escaped through magic, in the belief that Richards would fail to do so. With the aid of Doctor Strange, however, Richards learns to utilize magic on a basic level by accepting that he could not understand it and escapes. Richards proceeds to trick Doom into rejecting the demons, resulting in them dragging Doom to Hell. Doom remained trapped there until the events of the 2004 "Ragnarok" storyline in the pages of Thor, which resulted in Thor's hammer Mjolnir falling through dimensions and giving Doom a way out of Hell. The Mighty Avengers invaded Latveria, Von Doom's nation, due to his involvement in creating a chemical bomb that would infect people with the symbiote (though it was recently revealed that this attack was actually set up by Kristoff Vernard to put Doom out of the picture prior to Kristoff's future attempt at a coup). Due to Ultron's interference, the bomb was dropped on Manhattan, but the Mighty Avengers are able to stop the effects on the people. The Mighty Avengers proceed to invade Latveria. During the invasion, the Sentry, Iron Man, and Von Doom are sent to the past, thanks to the Latverian ruler's time platform. Eventually, the trio breaks into the Baxter Building and make use of a confiscated time machine to return to the present era, the Sentry taking advantage of the fact he will soon be forgotten by the world to easily defeat the Thing. Doctor Doom transports himself to Morgana's castle to summon up a magical army and captures the Avengers, but they free themselves and he is arrested for terrorist crimes against humanity after a brief struggle that culminated with the Sentry tearing off Doctor Doom's mask. The character is also featured in the Siege storyline, where he initially approves of Osborn's attack on Asgard before withdrawing from the arrangement. He also appears in the five issue mini-series Doomwar written by Jonathan Maberry. Doomwar sees the culmination of Doom's alliance with the isolationist group known as the Desturi, to take control of Wakanda. [volume & issue needed] He attacked and wounded T'Challa, the current Black Panther, maiming him enough to prevent him from holding the mantle again. [volume & issue needed] Doctor Doom's main objective was to secure Wakanda's store of vibranium, which he could mystically enhance to make himself unstoppable. However, this plan was thwarted when T'Challa triggered a device that destroyed Wakanda's entire vibranium stockpile, choosing to believe that his people could survive without the element rather than relying on it for so long. Doctor Doom in Thor #600 (April 2009). Art by Olivier Coipel and Marko Djurdjevic. In an attempt to save her series and possibly join the Avengers, Gwenpool (unaware that Doom has "reformed") attempted to attack him using an AI Doombot who goes by the name Vincent Doonan to lead her to him. Seeing this coming Doom easily captured her, though not until after she angered him by saying he looked like "Warmachine in a hoodie". He then told Vincent, who resented him though still saw Doom as his father, that he was proud of him. Gwen escaped, not surprising Doom because according to him "They always escape". Unwilling to risk what she sees as possibly her last chance to save herself because Doom has obviously only temporarily reformed, she attacks him anyway and releases an earlier version of Doom who has no problem fighting her and even seeing how she steps out of reality. It soon becomes obvious that Gwen is not established enough to kill Doom and new Doom steps in to defeat his doppelganger and save her. They talk and she accepts that she made a mistake and hopes he's right that people can be reformed. Later she gets Doom, Vincent, Dr. Strange, and Terrible Eye (Her friend Sarah) to help her sidekick Cecil regain human form. Victor Von Doom was born decades ago to a tribe of Latverian Romani people under the rule of an unnamed nobleman called the Baron. Victor's mother was witch Cynthia Von Doom who died by Mephisto's hand while Von Doom was young. His father, Werner, was the leader of the tribe and a renowned medicine man who kept his wife's sorceress life quiet in order to protect Victor from a similar fate. Soon after Cynthia's death, the Baron's wife grew incurably ill from cancer and Werner was called to the capitol to heal her. When she succumbed to illness, the Baron labeled Werner a murderer and called for his death. Werner escaped with young Victor, having realized the night before the woman would die. He goes on to die of exposure on the mountainside, cradling the boy in a final embrace and giving him his garments to keep him warm. Victor survived and, on return to the Romani camp, discovered his mother's occult instruments and swore revenge on the Baron. Victor grew into a headstrong and brilliant man, combining sorcery and technology to create fantastic devices which would keep the Baron's men at bay and protect the Roma people. His exploits attracted the attention of the dean of Empire State University, who sent someone to the camp. Offered the chance to study in the United States, Von Doom chooses to leave his homeland and his love, Valeria, behind. During the a confrontation between the Avengers and the X-Men, Doom allies with Magneto and others against Red Skull's Red Onslaught form. In an attempt to atone for past misdeeds, Doom absorbs the Scarlet Witch reality-altering powers and resurrects the dead Cassie Lang, whom he had accidentally killed. He subsequently makes a Faustian deal with an unspecified demon to resurrect Brother Voodoo. After returning to normal, Doom is taken into captivity for his initial killing of Lang. With the final Incursion imminent during the Secret Wars storyline, Doom usurps the power of the Beyonders with the aid of Doctor Strange and the Molecule Man, collecting what he can of the destroyed multiverse and forming a new Battleworld consisting of different alternate realities. He also assumes the role of God and claims complete dominion of this new world and its inhabitants, controlling them into thinking he was always the almighty force of creation; he takes Sue as his wife, Franklin and Valeria as his children, condemns the Human Torch to be the sun and Ben Grimm to be the Shield wall, and rewrites his own history to resurrect the majority of those whose deaths he caused. Richards and a ragtag collection of heroes and villains that survived the destruction of all universes challenge Doom and, with the help of Molecule Man, are able to take his power and restore the multiverse. Opting to heal rather than harm, Reed finally uses the Beyonder's power to heal Doom's face. Following the defeat of Tony Stark at the hands of Captain Marvel at the conclusion of Civil War II, Doom discovers his calling. Remembering his dissatisfaction as a God, Doom decides that it was his role to help heal the world. Inspired by Stark, and informing his A.I. duplicate that he intends to establish Stark's legacy, Doom fights for his unique brand of justice as the third Iron Man, and later comes into conflict with Mephisto disguised as The Maker, the evil Ultimate Universe version of Reed Richards. Doom goes on to join the Avengers, and later conceives a child with Dr. Amara Perera. Doom's sudden change sparked grievances that resulted in a group of villains, led by the Hood, to join forces to take him down. After the villains besieged Doom several times, the final battle occurred when the Hood attempted to take over Stark Industries, which happened not long after Stark had secretly recovered from his injuries. Tony confronted the Hood and stumbled into Victor. Doom took on the Hood and the unidentified demon possessing him one-on-one, and his face was severely burned by the demon in the process. Following the villains' defeat, Victor retreated to the ruins of Castle Doom. Later, a young woman named Zora Vokuvic breaks into Castle Doom demanding to see Doctor Doom. She makes it past the many Doombots that guard the palace before finally confronting Doom himself. She tells him that Latveria has been overrun with dictators and opportunists since he left and that the nation needs its leader back. Initially rejecting Zora's pleas for help, showing her his grotesquely scarred face in the process, Victor finally agrees when she refuses to give up and hands him his iconic mask, telling him the Latveria needs its true champion. Taking the mask, Doom ventures out into Latveria, quashing the civil war that is apparently raging and vowing to fix the country with his own strength – summoning magical energy as he does. Victor Von Doom is a polymath, scientist, and inventor who possesses genius-level intellect. Doom has invented several doomsday machines and robots during his career as a supervillain, among them being his Doombots. Doctor Doom can exert technopathic control over certain machines, most notably his Doombots. Throughout most of his publication history, he has been depicted as one of the most intelligent humans in the Marvel Universe, most famously restoring the Thing's human form, a feat Richards has never repeated. On the other hand, Richards managed to process all the computer calculations necessary to save the life of a disintegrating Kitty Pryde by himself, which is a feat that Doom at the time professed to be unable to do. 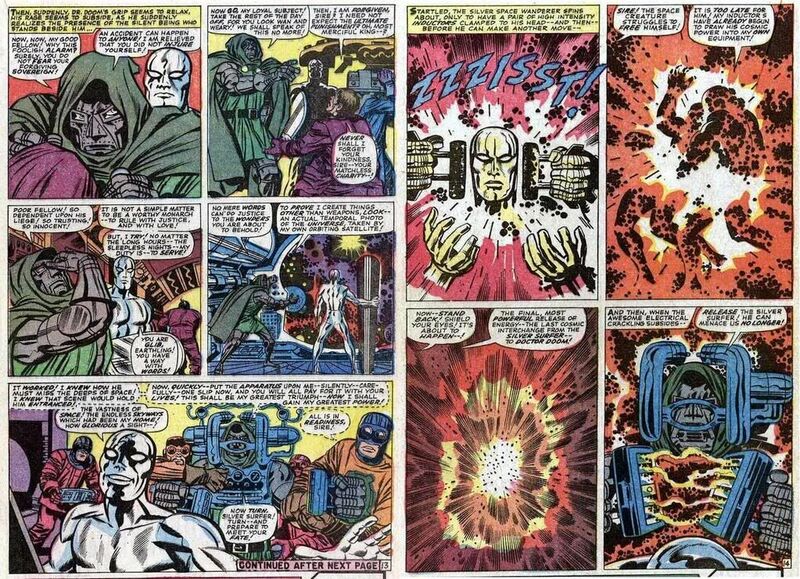 Doom has also used his scientific talents to steal or replicate the power of other beings such as the Silver Surfer or in one case the entity Galactus' world-ship. Along with being genius scientist and inventor, Doom is also a powerful sorcerer. Originally possessing minor mystical capabilities due to teachings from Tibetan monks, but later increased them to a considerable extent due to tutoring from his lover Morgan le Fay. He is capable of energy absorption and projection, manipulating electricity, creating protective shields, and summoning hordes of demonic creatures. Even at a time when his abilities were consistently referred to as minor, with assistance from his technology and by tag-teaming with Doctor Strange, Doom managed to come in second in a magic tournament held by the ancient sorcerer the Aged Genghis. After Strange relinquished the title of Sorcerer Supreme, he admitted that Doom had enough magical ability that he might become the new Sorcerer Supreme. The alien Ovoids inadvertently taught Doctor Doom the process of psionically transferring his consciousness into another nearby being through simple eye contact, as well as showing him other forms of technology which Doom uses to escape from incarcerations and to avoid being killed. However, if his concentration is broken, his mind can transfer back, and he rarely uses this power unless absolutely necessary due to his ego about his own appearance. In addition, Doom has a remarkably strong and indomitable will, as demonstrated in the graphic novel Emperor Doom when he dared his prisoner, the mind-controlling Purple Man, to attempt to control him and he successfully resisted. Doom also has the ability to use touchscreen devices even though he wears metal gauntlets all the time. Doom's armor augments his natural physical strength and durability to superhuman levels, to the point where he is able to hold his own against and even overpower superhuman foes like Spider-Man, the Hulk and the Thing in combat, although he tends to rely on long-range tactics when engaging physically stronger opponents. It is also nigh-indestructible, being able to take hits from most superhuman adversaries to some cosmic-level beings, and protects Doom from matter manipulation, reality warping and psychic assaults. The armor has an arsenal of high-tech weaponry and gadgets integrated within it, including gauntlets that can discharge lasers and force blasts, a defensive force field generator, and a lethal electric shock that can stun or kill anyone who comes into contact with Doom. The armor is self-supporting, equipped with internal stores and recycling systems for air, food, water, and energy, allowing Doom to survive lengthy periods of exposure underwater or in outer space. Even without his armor, Doom has proven himself to be a skilled hand-to-hand combatant, once even killing an endangered lion with a single punch, for no other reason than that he wished to. As the absolute monarch of Latveria, Doctor Doom has diplomatic immunity – allowing him to escape prosecution for most of his crimes – and total control of the nation's natural and technological resources, along with its manpower, economy, and military. Doom is known for the frequent plot device where in it is revealed that his actions were actually those of a "Doombot", one of Victor Von Doom's many robot doubles, either working on his behalf or as a result of rogue artificial intelligence. The plot element of Doombots is often used to retroactively erase events from Doom's history. On many occasions, Doom's only real weakness has been his arrogance. Layla Miller once reflected that Doom is incapable of accepting that he himself might be the reason for his failures. This is most keenly reflected in Doom's continued refusal to accept responsibility for the accident that fully scarred his face, instead preferring to blame Reed Richards for sabotaging his experiment. While his high opinion of himself is generally accurate, he is unable to accept when others may have a better understanding of a situation than he does – with the occasional exception of hearing the recommendations of heroes such as Mister Fantastic or the Thing when it is to his advantage. Even when teaming up with others against a greater threat, Doom will often try to subvert the alliance for personal gain. For instance, while allied with Adam Warlock and other heroes against the Titan Thanos, he attempted to steal Thanos’ Infinity Gauntlet before its owner had been defeated. Doom's honor code led him to save Captain America from drowning because Captain America had earlier saved his life, and on another occasion he thanked Spider-Man for saving him from terrorists attacking him in an airport by allowing him to leave alive despite Spider-Man subsequently insulting him. His code of honor also means that he will not attack a respected opponent who is weakened or at a severe disadvantage, as he regards any victory resulting from such circumstances as hollow and meaningless. He has even on several occasions battled opponents who were intent on killing the Fantastic Four, for no other reason than the fact that he does not want the ultimate defeat of the Fantastic Four to come from anyone's hands but his own. As the archenemy of the Fantastic Four, Doctor Doom has been included in almost every media adaptation of the Fantastic Four franchise, including film, television, and computer and video games. Rapper Daniel Dumile bases his personas MF DOOM and Viktor Vaughn, on Doctor Doom and Victor Von Doom respectively. In the album Mm.. Food several songs contain samples of Doctor Dooms lines in the 1981 Spider-man animated series. Described as "iconic", Doom is one of the most well-received characters of the Marvel Universe, as well as one of the most recurring; in his constant battles with heroes and other villains, Doctor Doom has appeared more times than any other character. The comics site Panels of Awesome ranked Doctor Doom as the number one villain in their listing of the top ten villains in comics; Wizard Magazine went a step further by declaring Doctor Doom the fourth greatest villain of all time. Comic Book Resources ranks Victor Von Doom as their fourth favorite Marvel character. Journalist Brent Ecenbarger cited him being able to "stand up against entities like Mephisto, the Beyonder, and Galactus and often comes out on top", as well as the tragedy of any "other number of circumstances could have led to Doctor Doom being a savior, but as it is, instead he remains Marvel’s greatest villain. ", a fact that later led to the character's redemption. Fellow journalist Jason Stanhope called his "master[ing] of sorcery and technology an unusual combination", and also felt "his inner sense of nobility sets him apart from lesser villains, in a similar manner to Magneto." Von Doom has also been favorably regarded by those who wrote for the character; Stan Lee declared Doom his favorite villain, saying that Doom "could come to the United States and he could do almost anything, and we could not arrest him because he has diplomatic immunity. Also, he wants to rule the world and if you think about it, wanting to rule the world is not a crime." Mark Waid echoed Lee's assessment of the character, stating that Doom "[has] got a great look, a great visual design [and] a dynamite origin." In 1984, the first Doctor Doom figure was released as part of Mattel's Marvel Super Heroes: Secret Wars line. In 1990, a Doctor Doom figure was included in ToyBiz's Marvel Super Heroes line. In 1994, ToyBiz released another Doctor Doom figure based on his appearance in the Fantastic Four animated series. A larger, deluxe edition of this figure was also released during the same year. In 1998, ToyBiz released a Doctor Doom figure in their Marvel Comics Famous Cover series. In 2002, ToyBiz released a Doctor Doom figure and a Doombot variant in their Marvel Legends line. A scarred version of this figure was later released in 2006 as part of a 7-pack. In 2006, Hasbro released a Doctor Doom figure in their Marvel Legends Icons series. In 2007, Hasbro released a Doctor Doom figure in their Marvel Legends line. A repaint of this figure and a Future Foundation variant were released in their 2012 Marvel Legends Epic Heroes wave. In 2008, a "Slash Attack" Doctor Doom figure was released based on his appearance in the 2007 movie Fantastic Four: Rise of the Silver Surfer. In 2009, a 3" Doctor Doom mini figure was released based on his appearance in MoonScoop's Fantastic Four: World's Greatest Heroes animated series. In 2010, a Doctor Doom figure was released in Hasbro's Marvel Universe line. An unmasked and Future Foundation variant of this figure were later released as a 2011 NYCC exclusive and in 2012, respectively. In 2015, ThreeA released a Doctor Doom (Stealth) 1/6 scale figure, which was distributed by GoodSmile Company. Doctor Doom was part of the 2012 trading card game "Hero Attax". ^ "Doctor Doom is Number 3". Comics.ign.com. Retrieved 2015-07-11. ^ Goldberg, Matt (10 November 2014). "Exclusive: Toby Kebbell Reveals Doctor Doom's Radically New Origin in THE FANTASTIC FOUR Movie". Collider.com. ^ a b c Lee, Stan (1976). Bring On the Bad Guys!. New York: Simon & Schuster. p. 12. ^ Lee, Stan (1976). Bring On the Bad Guys!. New York: Simon & Schuster. p. 13. ^ a b Schumer, Arlen (2003). The Silver Age of Comic Book Art. Collectors Press. p. 76. ISBN 1-888054-85-9. ^ a b Morrow, John; Kirby, Jack (2006). The Collected Jack Kirby Collector. TwoMorrows Publishing. p. 101. ISBN 1-893905-57-8. ^ a b Schumer, Arlen (2003). The Silver Age of Comic Book Art. Collectors Press. p. 77. ISBN 1-888054-85-9. ^ Christiansen, Jeff (2004). Marvel Encyclopedia Vol. 6: Fantastic Four. New York: Marvel Entertainment Group. pp. 63–66. ^ a b c Ashford, Richard (1995). Greatest Villains of the Fantastic Four: Introduction. Marvel Comics. pp. ii. ISBN 0-7851-0079-2. ^ Eury, Michael (2006). The Krypton Companion. TwoMorrows Publishing. p. 77. ISBN 1-893905-61-6. ^ Plowright, Frank (1997). The Slings & Arrows Comic Guide. Aurum Press. ^ Mari, Christopher (2000). Current Biography Yearbook. H.W. Wilson, Co. p. 81. ^ Staff (2005-12-10). "The Religious Affiliation of Comic Book Character Victor Von Doom". Adherents.com. Retrieved 2008-02-12. ^ "Image: DoomPowerCosmic0157.jpg, (1023 × 740 px)". i388.photobucket.com. Retrieved 2015-08-31. ^ Cronin, Brian (2007-04-26). "Comic Book Urban Legends Revealed #100". Comic Book Resources. Retrieved 2008-02-14. ^ a b Brady, Matt (2005-10-27). "Brubaker on Books of Doctor Doom ". Newsarama. Archived from the original on May 11, 2008. Retrieved 2008-02-14. ^ Tramountanas, George (2005-10-07). "Brubaker of Deflowering Doctor Doom". Comic Book Resources. Retrieved 2008-02-13. ^ Richards, Dave. "MABERRY DECLARES "DOOMWAR"". Comic Book Resources. Retrieved 2010-10-03. ^ a b "EXCLUSIVE: Doctor Doom is Marvel's "Infamous Iron Man," from Bendis & Maleev". Comic Book Resources. 8 July 2016. ^ Fantastic Four Vol. 6 #1 (2018). Marvel Comics. ^ "Fantastic Four 10 A, Jan 1963 Comic Book by Marvel". Comiccollectorlive.com. Retrieved 2010-08-16. ^ "Fantastic Four 287 A, Feb 1986 Comic Book by Marvel". Comiccollectorlive.com. Retrieved 2010-08-16. ^ North, Ryan (May 10, 2016). THE UNBEATABLE SQUIRREL GIRL VOL. 3: SQUIRREL, YOU REALLY GOT ME NOW (1 ed.). Marvel Publications. ISBN 978-0-7851-9626-6. ^ "Revamped Doctor Doom Respect Thread/VIII. SKILL". Killer Movies Community Forums. Retrieved 2011-03-28. ^ a b Sanderson, Peter (2007-02-24). "Comics in Context #166: Megahero Vs. Megavillain". QuickStopEntertainment.com. Retrieved 2008-02-13. ^ Sanderson, Peter (2007-02-17). "Comics in Context #165: The Supervillain Defined". QuickStopEntertainment.com. Retrieved 2008-02-13. ^ a b "Love Him or Hate Him: Doctor Doom". UGO Networks. Archived from the original on 2007-12-10. Retrieved 2008-02-10. ^ Haynes, Mike (2007-12-10). "Countdown: Top 10 Comic Book Villains". Panelsofawesome.com. Archived from the original on 2008-06-14. Retrieved 2008-02-12. ^ Brian Cronin (2007-09-26). "Top 50 Marvel Characters #4". Comic Book Resources. Retrieved 2008-02-14. ^ Brummett, Erin (2007-08-15). "VOA Online Discussion: Comic Book Heroes". Voice of America. Archived from the original on 2007-12-15. Retrieved 2008-02-02. ^ Contino, Jennifer (2003-05-29). "Waid's Fantastic Quartet". ComicCon.com. Archived from the original on 2009-04-13. Retrieved 2008-02-14. ^ "Doctor Doom's Fearfall". Universal Orlando Resort. Archived from the original on 2008-02-13. Retrieved 2008-02-14.